Former Arsenal winger Oxlade Chamberlain has lavished praise on fellow summer signing Mohammed Salah who joined the Reds from Roma in the summer for £35 million and has looked like a bargain already after his goal scoring exploits since his move to Anfield in the summer. 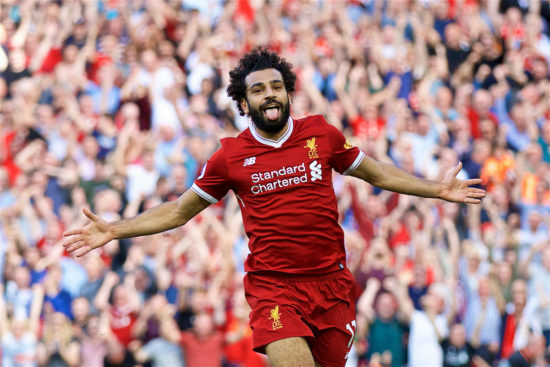 The Egyptian international scored a brace against struggling side West Ham at the London Stadium on Saturday as the Reds thrashed the hammers 4-1 in front of their home fans. English international Alex Oxlade Chamberlain is stunned by his purple patch in front of goal and hopes his goal scoring exploits continues. “For someone to have that goal return so quickly, settling into a new team as well, is an amazing achievement,” Oxlade-Chamberlain told club website. The former Roma winger has settled in quickly at the club and has forged good partnership with his fellow attackers such as Sadio Mane and Roberto Firmino. One of Liverpool’s strongest point is their attack as the pace and threat they possess in attack can frighten any defence in Europe. The Egyptian international couldn’t break into the Chelsea team when he joined the Blues in the 2014/15 season as he was limited to just three Premier League starts under Jose Mourinho, but loan spells to Fiorentina and Roma seems to have helped him mature as a Player as he is gradually becoming a Fans favorite at Anfield. The 25-year-old looks reborn under Jurgen Klopp having scored 12 goals in 17 appearances for the Reds in all competitions so far this season. He is known for his blistering pace, dribbling skills, trickery, creating for his teammates and also have an eye for goal. He is often deployed as a winger on the right side of the midfield and could also play in the hole behind the striker.